Republicans in the West Virginia state legislature held a "GOP takes the Rotunda" event at the state capitol on Friday. As part of this event they hung a poster of the 9/11 al-Qaeda attacks on the Twin Towers, labeled "Never Forget—You said." Below it they placed a picture of Congresswoman Ilhan Omar with the caption "I AM PROOF THAT YOU HAVE FORGOTTEN." GOP’s life blood is more Hate and Division. Don’t buy what they’re selling. 18 years later and the lies continue, I’m tired of this. Where do these ignorant buffoons get their ammunition for such vile racism? From mainstream writers like Juan Cole, who in this case brings you the story of ignorance in the WV statehouse, then goes about repeating the fabricated BS official 9/11 story that we were attacked from an outside force, as if it were true. Juan if you, or anyone else still believes this lie, get off your butts, do some research, and educate yourself, or remain as ignorant as those in the WV statehouse. It’s no wonder these kind of things keep happening, US “reporters” keep repeating the official lie, and not enough of us call them out on it. Very true! But I think many reporters have no choice but to be gatekeepers in order to stay employed. And that also goes for progressive sites like CD and Democracy Now! Never any articles or interviews with any alternative 9/11 theories. Makes me wonder if somehow their broadcast licenses could have been threatened in some way, because any alternative 9/11 theories have been certainly censored. We are generally speaking of an uninformed, stupid, self engrossed population. It’s no wonder false flag operations always succeed in the U.S.A. If the bigots and islamophobes knew how whites, including American government persons and other governments were the culprits, their world would crumble. Hey Ann. Don’t complain when someone shouts all Jews are… You’re the same kind of racist trash. The Democrats are also attacking Rep Omar claiming she is being Anti-semitic when she points out the US Government pushes loyalty to a foreign Country. With laws passed against supporting BDS and with multiple votes in both the House and Senate where elected members vote on their support of Israel , this is exactly what they are doing. There have been votes on the house of 352 to 21 proclaiming support of Israeli Polcies against Palestine , just as example. 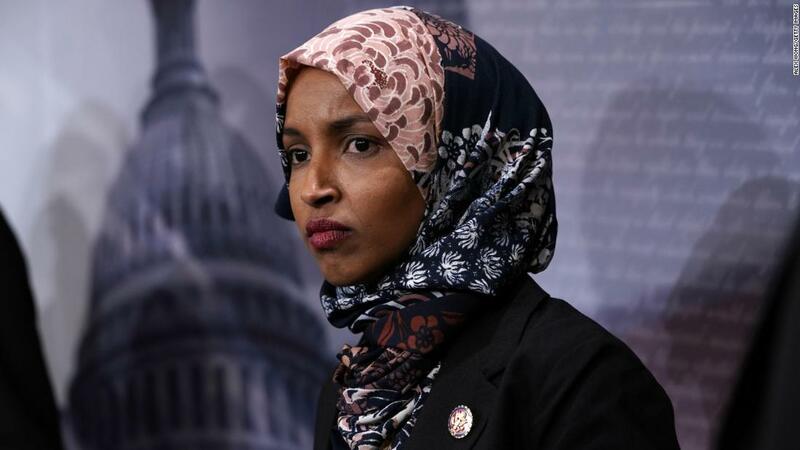 The chairman of the House Foreign Affairs Committee called Friday for freshman Democratic Rep. Ilhan Omar to apologize after insinuating that pro-Israel groups are pushing "allegiance to a foreign country." I am with you, Suspira. She criticizes AIPAC, Israel’s inhumane policies against Palestinians, and the money that fuels both and gets called anti-Semitic. Angela Davis and Israeli’s for Peace are among the many (like me) who support her statements. On the West Virginia GOP, many should keep their eye on the lone female newly elected to the House GOP, Congresswoman Carol Miller who came to us courtesy of this same West Virginia legislative body. You’ll remember her questioning in Wednesday’s Cohen hearing. She was born and raised in Ohio where her dad, former longtime Congressman Samuel Devine, headed the Ohio Unamerican Activities Committee in the 50’s. You are under the thrall of the same conspiracy-theory nonsense as the Islamophobic right and the man-in-the-sky bible-thumpers. And those who cling to these psychotic beliefs completely miss the most important point - the Sept 11 Al Queada terrorist attacks were a fully predictable response to US militarism in the middle east - “chickens coming home to roost” as Ward Churchill wrote about them. You keep drinking the Kool-Aid, see how that works out for you. Is it any wonder that Trump won West Virginia with 67.9 percent of the vote. The coal dust must have damaged their brains and turned them all into hopeless bigots. From my perspective Congresswoman Omar is the only courageous representative in congress willing to point out the atrocities being committed against the Palestinians by the Israelis. Apparently she did not get the memo that you are not allowed to criticize Israel no matter how cruel they are to the Palestinians or how many innocent unarmed women and children they shoot down at their border. Like Omar said: it is all about the Benjamin’s and large donations from Israeli organizations make the recipients of those bribes remain silent in the face of horrific atrocities. My fellow Americans your disgusting ignorant intolerant bigotry makes me sick. This would be a non-story if the woman who brought the poster was in a handful of nut cases. It becomes news if we know that a significant number of people in the US think there is some logical connection between the top and the bottom of the poster. I’m afraid that could be true, but I’d probably have to find some different poll questions and extrapolate (I doubt this poster has been polled). Of course whoever creates these types of posters aren’t remotely interested in logic - if they were, why not include pictures of all Muslim representatives? Or is it just the hijab that they are objecting to? I don’t like them myself, but I don’t like a lot of stuff - ties are mornonic as well and thankfully I’m not required to wear these strangulation devices. But I wouldn’t go so far as to ban them, but I’m not comfortable going any further (I would agree to a ban on garments that block the face for all government representatives). I’m not in MN and don’t know Ilhan’s performance overall, but her stance on Venezuela and attacking Abrahams was fantastic - I’d love more like her (including hijabs for all of them - if that’s what they want).